While on the Passing Cloud we anchored in Louscoone Inlet a couple of times. It is a pretty amazing place, right on the edge of the outer Pacific Ocean not far from extremely deep water, with pelagic species venturing in from time to time. 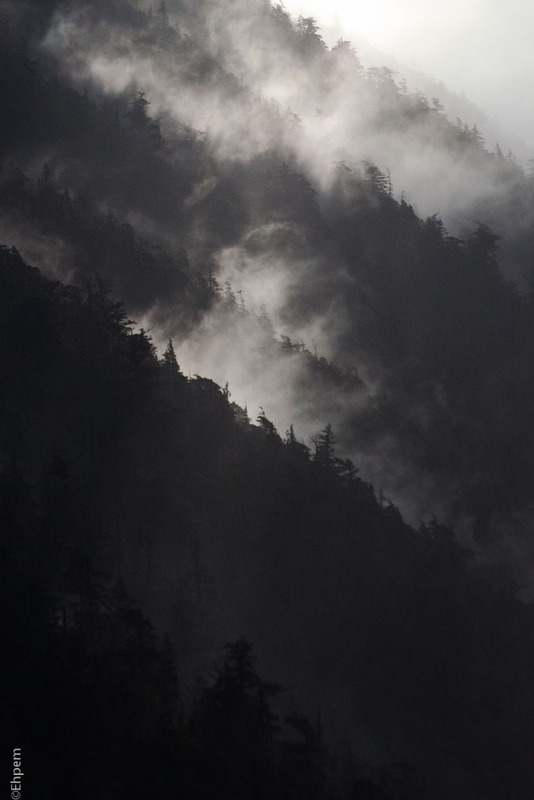 And the forests catch and hold the mist at dawn. Beautiful…there’s nothing like mist, or fog. Totally true. These moments are the ones that really speak to me of the place – they are quiet and peaceful and transitory. Thank you Valerie – a good use for a telephoto lens, collapsing the ridges into a flatter plane adds to the unearthly feel.